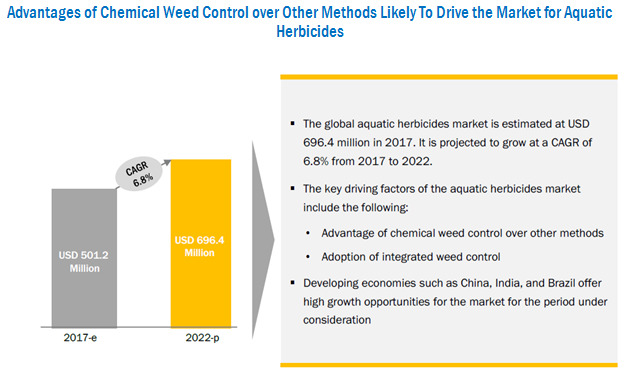 [141 Pages Report] The aquatic herbicides market was valued at USD 470.9 Million in 2016 and is projected to reach USD 696.4 Million by 2022, growing at a CAGR of 6.8% from 2017, in terms of value. The objectives of this study are to define, segment, and project the size of the aquatic herbicides market based on type, application method, mode of action, application, and key regions. This report includes the estimation of the market size for value (USD million) and volume (metric tons). Both, top-down and bottom-up approaches have been used to estimate and validate the size of the aquatic herbicides market and to estimate the size of various other dependent submarkets in the overall market. Key players in the market have been identified through secondary research (FAO, Bloomberg Businessweek, Factiva, and companies’ annual reports), and their market shares have been determined through primary and secondary research. All percentage shares, splits, and breakdowns have been determined using secondary sources and verified through primary sources. The various contributors involved in the value chain of aquatic herbicides include manufacturers, suppliers, distributors, intermediaries, and customers. 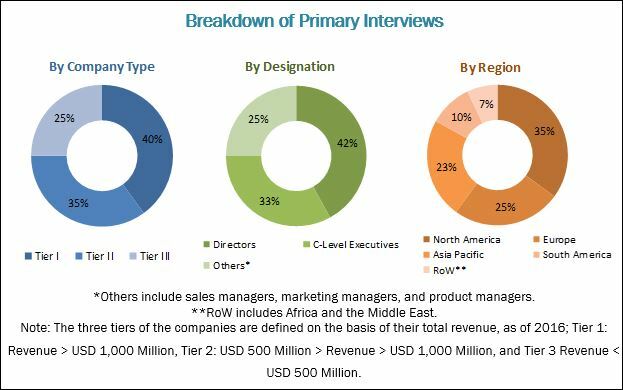 The key players in the aquatic herbicides market include Dow Chemical (US), BASF (Germany), Monsanto (US), Syngenta (Switzerland), Nufarm (Australia), Lonza (Switzerland), Land O'Lakes (US), UPL (India), Platform Specialty Products (US), SePRO Corporation (US), Albaugh (US), Valent (US), and SANCO INDUSTRIES (US). With the given market data, MarketsandMarkets offers customizations according to the client-specific needs. The aquatic herbicides market was valued at USD 501.2 Million by 2017. It is projected to reach USD 696.4 Million by 2022, growing at a CAGR of 6.8% from 2017. The market has largely driven the growing adoption of integrated weed control. It is used when long-lasting weed control is required at inexpensive costs and with less undesired side effects. The advantages of using aquatic herbicides over other treatment methods such as manual and mechanical methods are also driving the market for aquatic herbicides. The glyphosate segment is projected to dominate the market through the forecast period. Glyphosate is an important segment of the market as the formulation of glyphosate is less expensive than the mechanical or manual removal of aquatic weeds; it also provides long-term control of weeds when compared to other biological and mechanical methods. The foliar segment is estimated to dominate the market as foliar application takes less time and ensures better weed cover as compared to the submerged application. More herbicides are registered for foliar application, which is projected to drive the foliar segment in the aquatic herbicides market. The North American region dominated the market in 2016 and is projected to grow at a moderate CAGR from 2017 to 2022. The presence of leading aquatic herbicides manufacturers who operate on a global level and the rising adoption of integrated weed management drive the demand for aquatic herbicides in the region. Thus, aquatic herbicides are extensively used in agricultural waters, canals, irrigation waters, recreational waters, and fisheries. They remove the undesirable plants that might cause damage, fire hazards, or pose impediments to work crews. They also reduce the costs of labor required for removing these weeds. This increased use of aquatic herbicides in agricultural waters and recreational waters drives the growth of the aquatic herbicides market in North America. In the Asia Pacific region, Australia and New Zealand dominate the market. The major herbicides used in this region to control underwater weeds are glyphosate, 2,4-D, and diquat. Glyphosate is the most effective weed killer used in New Zealand for controlling emergent weeds. Diquat is the oldest herbicide, which has been used for over 40 years in New Zealand for controlling submerged weeds as it does little harm to non-nuisance native species. Concerns among applicators about fish kills, damage to desirable plants, and the effect of herbicide application and prolonged process of approval due to the stringent regulatory approval process restrain the aquatic herbicides market growth. The aquatic herbicides market is concentrated, with leading companies driving the market growth. This report provides a qualitative analysis of the prominent market players and their preferred development strategies. Key players such as Dow Chemical (US), BASF (Germany), Monsanto (US), Syngenta (Switzerland), and Nufarm (Australia) have been profiled in the report. These leading players have adopted various strategies such as expansions, mergers & acquisitions, and collaborations/partnerships/agreements to explore new and untapped markets, expanding in local areas of emerging markets, and developing a new customer base for long-term client relationships. This has not only enabled the key players to expand their geographical reach but has also reinforced their market position by gaining a larger share in terms of revenue and product portfolios. Small-scale players have also adopted these strategies to expand their businesses globally by investing in the establishment of manufacturing facilities and technical service centers in various regions. This inorganic growth strategy enables them to improve their technical expertise through intensive R&D infrastructure offered by bigger players.